For other uses, see Narayan (disambiguation). 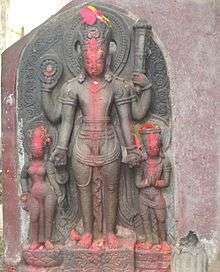 Narayana (Sanskrit: Nārāyaṇa) or Narayanan is the Vedic Supreme God according to Vedas, Itihasas, Bhagavata Purana and Other Puranas (including his different avatars) in Hinduism, venerated as the Supreme Being in Vaishnavism. He is also known as Vishnu and Hari and is venerated as Purushottama or Supreme Purusha in Hindu sacred texts such as the Bhagavad Gita, the Vedas and the Puranas. Narayana is the name of God in his infinite all pervading form. Narayana is one of the names of Vishnu (and sometimes Krisna). He is the Supreme Purusha of Purusha Sukta. The Puranas present a seemingly divergent, but accurate description of Narayana (as an Enlightened Supreme Being). The fifth verse of the Narayana Sukta, a hymn in Yajurveda, states that Narayana pervades whatever is seen or heard in this universe from inside and outside alike. Another important translation of Narayana is The One who rests on Water. The waters are called narah, [for] the waters are, indeed, produced by Nara-Narayana (the first Being); as they were his first residence [ayana], he is called Narayana. In Sanskrit, "Nara" can also refer to all human beings or living entities (Jivas). Therefore, another meaning of Narayana is Resting place for all living entities. The close association of Narayana with water explains the frequent depiction of Narayana in Hindu art as standing or sitting on an ocean. 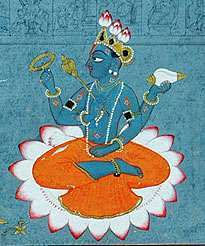 In Hindu sacred texts like Vedas, Puranas etc., Narayana is described as having the divine blue colour of water-filled clouds, four-armed, holding a Padma (lotus flower), mace Kaumodaki, Panchajanya shankha (conch) and a discus weapon Sudarshana Chakra. Narayana is also described in the Bhagavad Gita as having a 'Universal Form' (Vishvarupa)Vishvarupa which is beyond the ordinary limits of human perception or imagination. Bhagavata Purana declares Narayana as Para Brahman Supreme Lord who creates unlimited universes and enters each one of them as Lord of Universe. Narayana engages in creation of 14 worlds within the universe as Brahma when he deliberately accepts rajas guna. Narayana himself sustains, maintains and preserves the universe as Vishnu when he accepts sattva guna and annihilates the universe at the end of maha-kalpa as Shiva or Rudra when he accepts tamas guna. According to this reference, the holy Trimurti is non-different from Narayana. Narayana is also venerated as Mukunda which means God who is giver of mukti or Moksha or liberation from cycle of births and deaths in the material world. Narayana's eternal and supreme abode beyond the material universe is Vaikuntha which is a realm of bliss and happiness. It is also known as Paramapadha, which means final or highest place for liberated souls, where they enjoy bliss and happiness for eternity in the company of supreme lord. Vaikuntha is situated beyond the material universe and hence, cannot be perceived or measured by material science or logic. 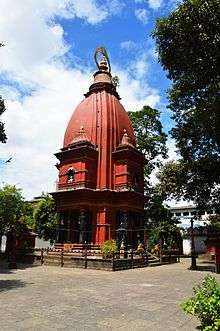 Sometimes, Ksheera Sagara where Narayana or Vishnu rests on Ananta Shesha is also perceived as local Vaikuntha with in the material universe. In the Mahabharata, Krishna is often referred to as Narayana and Arjuna as Nara. The epic identifies them both in plural 'Krishnas', or as part incarnations of the earlier incarnations of Vishnu, recalling their mystical identity as Nara-Narayana. Narayana is spoken of in the scriptures as being 'parabrahman', 'paramatma' 'parameshwar' 'parashakti' and 'parajyothi' which are all ways of saying "absolute" or "supreme" God/Soul/Lord/Energy/Light. In the Vedas it is written that that "Narayana parabrahman tatvam Narayana paraha |", which points to how Narayana is essentially the supreme force and/or essence of all. Antar Vahisca Sarvam vyapta Narayana stitaha means inside and out Narayana is pervaded throughout the universe both spiritual and material universes. He resides at the blissful Vaikuntha planet, which is situated at Swetadwipa, he is also called Vaikuntha nathan and Ksheerabdhi nathan means the lord of milk ocean, he plays his divine pastimes with his consort Lakshmi and other liberated souls. He never leaves milk ocean but his power works throughout the universe as it says in Upanisada "Om purna midam purnat purna muduchyate" means he is the complete whole, even though everything comes from him, he is still the complete. Another important translation of Narayana is "The Supreme Being who is the foundation of all men". Aapah samaakhyaat means naarah known as aapah (Water), Naaraanaam aaditah ayanan yasya sah (from the beginning (aditah) you are resting in (ayanam) that is why (yasya sah), oh lord of past and future (bhoot-bhavuesha, you are called (shabditah) Narayan. In Mahabharata Naar means water in human (Nar) body, is residence (Aayan) of God (Narayan). Another interpretation of the word Narayana sees Nara meaning "human" and Ayana as "direction/goal". Some view Narayana as meaning "son of man." Hence Narayana refers to the "direction of a human" (or the one that helps a human to his/her goal, i.e. towards moksha). Nara is related to moksha as both are rooted to the Water element (Ap), one of the Great Elements (Mahābhūta). (See also Tattva). Nara means humans and Ayana means shelter so Narayana means the shelter of all human beings. The Narayana Upanishad reads: Om Namo Narayanayeti mantra upasaka Vaikuntha bhuvanam gamishyati, or "Whosoever chants the 'Om Namo Narayana' mantra reaches the ultimate goal Vaikuntha planet where one attains eternal blissful life." Vaikuntha is the supreme spiritual abode; there is nothing that exists beyond Vaikuntha, Vaikuntha means 'no desires'. 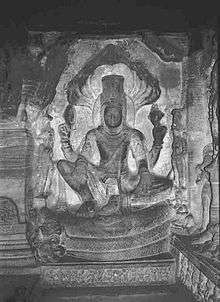 Narayana's sculpture at Badami resembles Bodhisatva Avalokitishwara or Dakshinamurthy. Narayana is hailed in each and every part of Vedas like Shatarudriyam, Purusha Suktam, Narayana Suktam, Hiranyagarbha Suktam, Vishnu Suktam, Rudra Suktam and Upanishads like Isopanishad, Chandogya Upanishad, Brihadaranyaka Upanishad, Mundaka Upanishad, Mandukya Upanishad, Katha Upanishad, Kenopanishad, Prasna Upanishad, Svetasvatara Upanishad, Maha Narayana Upanishad, Narasimha Tapani Upanishad. ↑ Bhagavata Purana (12.12.56): "Narayanam Devam adevam isam - Lord Narayana, the Supreme controller and the ultimate Soul of all existence, beyond whom there is no other god. ↑ Bhagavata Purana (12.13.16): Just as the river Ganges is the greatest of all rivers, Lord Achyuta (Vishnu or Narayana) the supreme among deities (devas) and Lord Shambhu (Shiva) the greatest of Vaishnavas, so Bhagavata Purana is the greatest of all Puranas. ↑ Prabhupada, AC Bhaktivedanta. "Bhagavad-gita As It Is Chapter 11 Verse 3". vedabase.net. Retrieved 2008-05-10. "see the cosmic manifestation"
↑ Vaisnavism Saivism and Minor Religious Systems, Ramkrishna Gopal Bhandarkar. Published by Asian Educational Services, p.46. ↑ "॥ नारायणसूक्तम् सार्थ ॥ - .. Narayana Sukta .. - Sanskrit Documents". sanskritdocuments.org. Retrieved 2015-10-21. 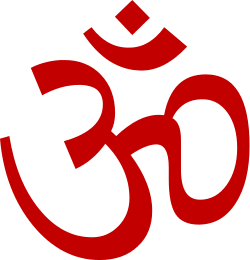 ↑ "Om Purnamadah Purnamidam - in sanskrit with meaning - mantra from Upanishad". www.greenmesg.org. Retrieved 2015-10-21. ↑ "Narayanastra – Defending Vaishnavism as the supreme Vedic position". narayanastra.blogspot.in. Retrieved 2015-10-21.